This data set includes orthorectified Landsat ETM+ scenes across the Legal Amazon region. At least one scene is provided for each spatial tile, representing the most cloud-free retrievals from mid-1999 through late 2001 (Fig. 1). Dates are therefore not continuous but include scenes from July 8, 1999 to November 13, 2001. Data have been atmospherically corrected and orthorectified. Data files (and format) included for each scene are: six multispectral bands (tif), two thermal bands (tif), one panchromatic band (tif), two preview files (jpg), and one metadata file (txt). The individual Geotiff files have been g-zipped and subsequently all of the files for a scene have been g-zipped together for ordering convenience. Figure 1. Spatial distribution of Landsat ETM+ scenes across the Legal Amazon region. Figure 2. Example preview figures for the tile designated Path 1 and Row 60 on October 3, 2001. The left image (p001r060_7t20011003.742.preview.jpg) displays bands 7, 4 and 2. The right image (p001r060_7t20011003.preview.jpg) displays bands 4, 3 and 2. TRFIC (Tropical Rain Forest Information Center, Basic Science and Remote Sensing Initiative, Michigan State University (http://www.trfic.msu.edu)). 2007. LBA-ECO LC-10 Orthorectified Landsat ETM+ Data for Legal Amazon: 1999-2001. Data set. Available on-line [http://www.daac.ornl.gov] from Oak Ridge National Laboratory Distributed Active Archive Center, Oak Ridge, Tennessee, U.S.A. doi:10.3334/ORNLDAAC/846. This data set includes Landsat ETM+ coverage of the Legal Amazon region from July 1999 to November 2001. 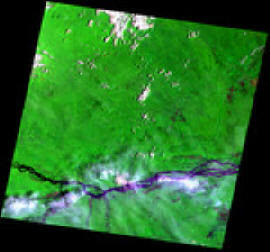 LBA-ECO LC-10 Landsat TM Data for Legal Amazon: 1986-1994. This data set includes orthorectified Landsat ETM+ scenes across the Legal Amazon region. At least one scene is provided for each spatial tile, representing the most cloud-free retrievals from mid-1999 through late 2001. Dates are therefore not continuous and include scenes from July 8, 1999 to November 13, 2001. There are several tiles that have 2 scenes, that is, there are some path/row combinations with more than one retrieval for the same area, but from different dates. The following path/row combinations have2 scenes each: p3r61, p224r65, p231r60andp231r62. Each zipped data directory is constructed from a concatenation of path + row + date (e.g. Path_001/Row_061/p001r61_7x000914). The final 6 digits indicate year=00 (i.e. 2000), month=09, day=14. The data set covers the period 1999/07/08 to 2001/11/13. These data were collected from the Landsat ETM+ sensor. Due to their high resolution, they are especially appropriate for small-scale/mesoscale land cover change studies. Data are atmospherically corrected and orthorectified. The individual images should be highly useful as they include very little cloud cover, but care should be used if they are mosaicked together since retrieval dates vary. 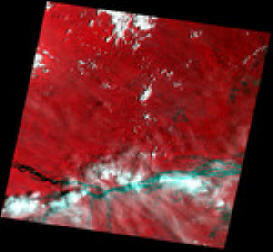 Original Landsat scenes were acquired from Eros Data Center (EDC). These data are available through the Oak Ridge National Laboratory (ORNL) Distributed Active Archive Center (DAAC) or the EOS Data Gateway.